The obsession of cholesterol during the past half-century has been a triumph of dogma over evidence. There are many aspects to this but one simple but little-known finding is that in people over the age of 60 those with the highest cholesterol level in the blood have the longest survival. It is this age-group that the incidence of death and other cardiac events occur. The evidence for this comes from three sources. The first was an investigation of a group of women aged 60 years or more who were living in a nursing home in Paris. 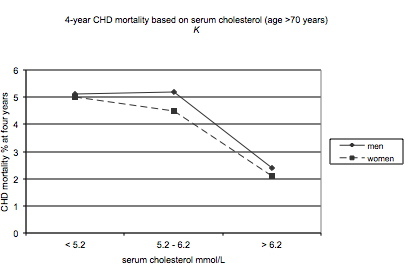 They were followed up for five years and it was quite clear that those with the lowest serum cholesterol had the worst survival. 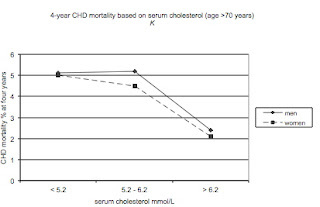 The death rate in those with a serum cholesterol of 4mmol/L was 5.2 times the death rate in those with a serum cholesterol of 7mmol/L. 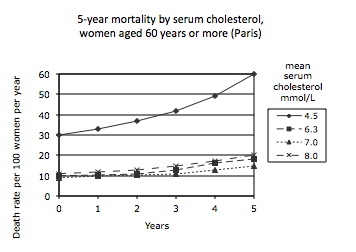 If you are a woman and above the age of 60, do you really want to have a low cholesterol? The graph shows the death rate per year based on blood (serum) levels of cholesterol. As the subjects become older the death rate inevitably increases, but more so in those with the lowest cholesterol levels. The evangelists of the diet-cholesterol-heart hypothesis would not like this evidence, and it effectively has been suppressed - no-one seems to know about it. They might argue that the reason for the high death rate in those women with low serum cholesterol is that they were dying of cancer, but this possibility was eliminated at the start of the study and during the five-year follow-up during which 53 of the 92 women died, autopsy revealed cancer to be the cause of death in only one. 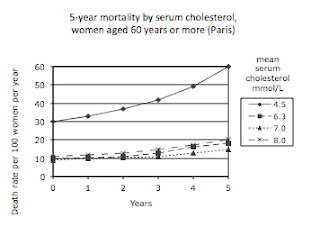 Another interesting result was that at the onset of the study the average serum cholesterol of women known to have coronary heart disease was 5.9mmol/L. The corresponding cholesterol was higher at 6.3mmol/L in those who were not known to have coronary heart disease. Again we see an advantage of a high cholesterol. A second study of the elderly was undertaken in New Haven, Connecticut, a community-based study of 997 persons aged more than 70 years with follow-up for four years. The coronary heart disease mortality was once again that a higher level of serum cholesterol was associated with a lower death rate from coronary heart disease. This graph shows the death rate but at a single point after four years. For men and women the lowest death was highest in those with the lowest cholesterol, less than 5.2, and lowest in those with the highest cholesterol, greater than 6.2. 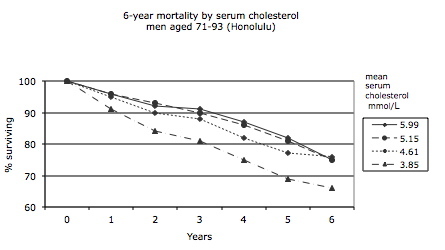 A similar result came from the Honolulu Heart Program, a study of 3572 men aged 71 to 93 years. Survival over a period of six years was expressed in four groups (quartiles) based on blood cholesterol levels. 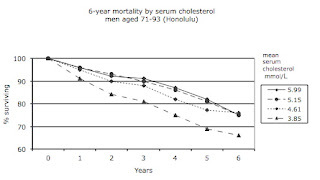 Those with lowest serum cholesterol level had the worst survival, that is the highest mortality. The results were unchanged when first-year deaths were discounted, the purpose of this being to avoid the possible effect of low serum cholesterol and death being due to present but undiagnosed cancer. In this graph we see the percentage surviving. It was clearly lowest in the quartile with the lowest cholesterol. The conclusion appears to have been suppressed in the interest of those who benefit from the diet-heart-cholesterol hypothesis - pharmaceutical companies, food manufacturers and the academic departments which derive their funding from them. There have been no studies published that show anything other than this detrimental effect of a low cholesterol level above the age of 60. To see the truth in younger age-groups you will need to wait for another post shortly. You talk so much sense David. It is a delight to read your posts, but where are the comments?. Come on everybody these issues are so important. Does everyone agree with you or are they not prepared to disagree? As a blogger myself I find feedback so important. Information from Bupa about the symptoms, treatment and causes of gallstones gallbladder pains. Symptoms include abdominal pain, vomiting and high temperature.